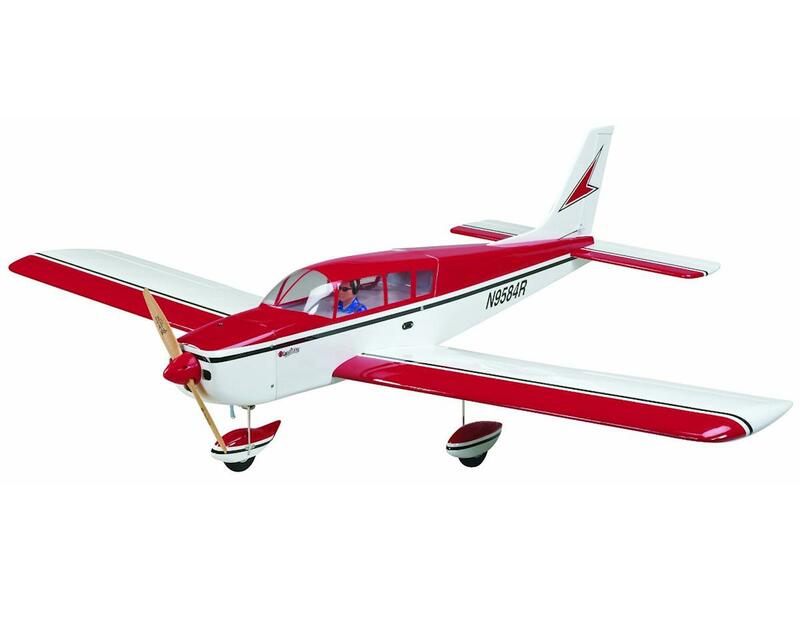 This is the Great Planes Cherokee .40-.56 Electric Powered/Gas Powered ARF Sport-Scale Airplane. The Cherokee ARF is a great step up from your basic trainer — and one of the few realistic sport-scale alternatives for low-wing flight training. Its fast 4-6 hour assembly and steady performance provide the right foundation for success, complemented by quality wood and fiberglass construction plus the freedom to use glow or electric power. Assembly: The Cherokee ARF goes together in just a few hours. Its factory-built main structures are covered in MonoKote film, and the fiberglass cowl and wheel pants are painted to match. Pre-hinged control surfaces save you even more time! Cockpit Area: The cockpit area – with installed pilot figure – doubles as a hatch that removes for easy access to batteries for an outrunner brushless motor system. The fuselage offers generous space for radio gear, allowing you to use standard-sized servos and receivers. Flap Operation: Separate standard servos control the pre-hinged ailerons and flaps. Flap operation requires a 5-channel radio system; you can use your 4-channel radio to fly without working flaps. Hardware for both set-ups is provided. Tail Assembly: No glue is used for tail assembly. The horizontal and vertical stabilizers install quickly with screws, which align them automatically – and allow you to remove the surfaces easily for transport if desired. Adjustable Rails: The Cherokee excels with 2- or 4-stroke glow or brushless electric power. Its detailed, photo-illustrated assembly manual takes you step-by-step through installation of either power choice. Fiberglass Wheels: The fiberglass wheel pants and cowl arrive painted to match the trim scheme. Each wheel pant attaches to the landing gear with two screws and a nylon strap. Servos: The fuselage offers generous space for radio gear installation, allowing you to use standard sized servos and receivers. Tricycle Landing Gear: You'll enjoy positive handling on grass or pavement from the Cherokee's tricycle landing gear — a configuration familiar to anyone who's mastered a typical 4-channel R/C trainer. 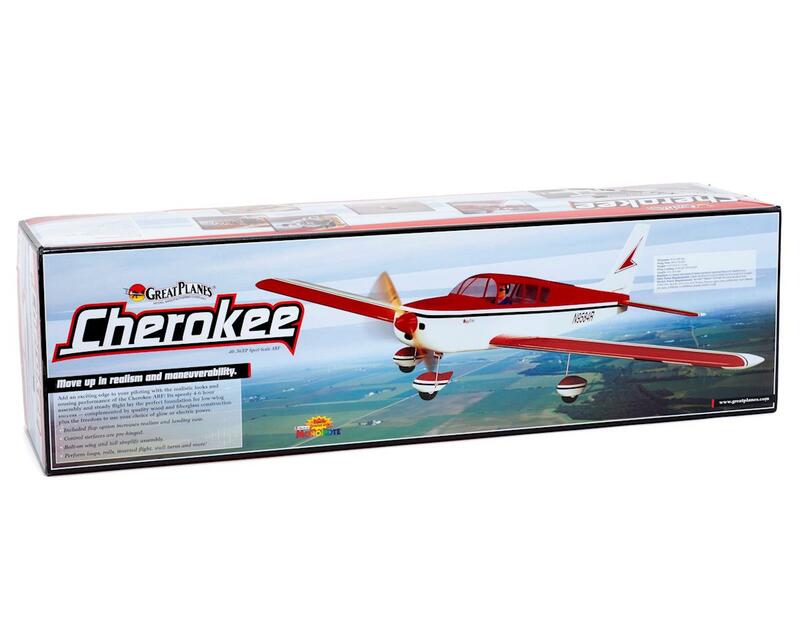 Fiberglass Wheels: The Cherokee ARF makes a fine choice for everyday sport flying and aerobatics. With a 5-channel radio, you can operate the included flaps – for even greater realism and flight control. Ideal for everyday sport flying and aerobatics – perform loops, rolls, inverted flight, stall turns and more! Bolt-on wing and tail simplify assembly and transport. Operate the included flaps with a 5-channel radio for even greater realism and flight control. Tricycle landing gear provides positive handling on grass or pavement.